As the race rapidly approaches, Barnhart and O’Bryan ventured to Navarre Beach, Florida to build relationships with the other people they will travel within just four months. The strong friendship between Barnhart and O’Bryan already makes the transition to living out of their backpacks for nine months much easier, along with the budding friendships with the other girls participating. 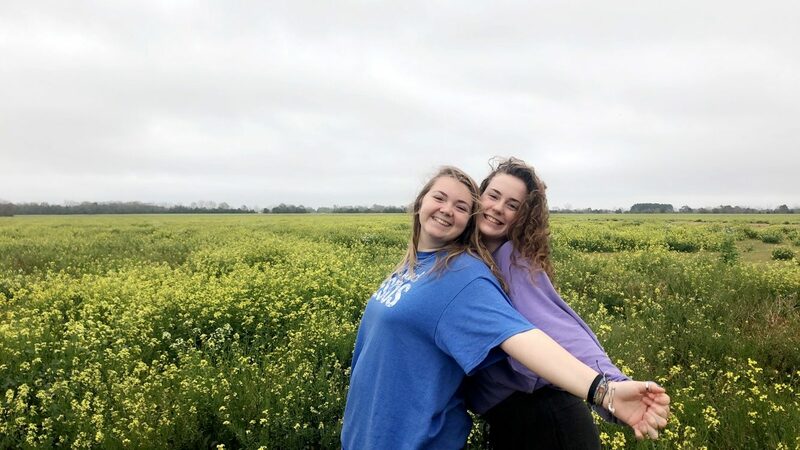 In five short months, seniors Sam Barnhart and Maggie O’Bryan will share their love of Jesus and serve others around the world in Swaziland, Thailand, and Nicaragua. 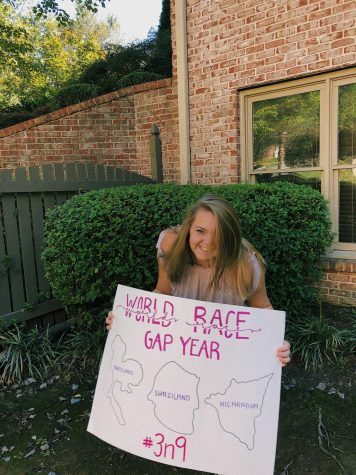 Both seniors applied to a mission trip organization called The World Race Gap Year that will allow them to travel the world for nine months. While other seniors work on college applications and deadlines, Barnhart and O’Bryan will prepare to spend nine months teaching English and evangelism, planting churches, working in orphanages and clinics, and building houses. Along the World Race, participants will visit three different continents, but the countries vary depending on the route chosen. The organization hopes to expose people to real-world problems, such as poverty, addiction, and destitution. Participants travel and live in a tight community, replicating the ways of the early Church. O’Bryan and Barnhart hope to strengthen and share her religion around the world. “My feelings are all over the place [about the gap year]. No doubt this is what the Lord has called me to and I am so excited about it. However, I feel really nervous and scared sometimes, but it never outweighs the excitement,” O’Bryan said. Including flights, meals, lodging, and insurance, the mission trip costs $16,600— comparable to the cost of one year at a good college. The World Race encourages travelers to fundraise to cover the price in various ways, such as selling t-shirts and jewelry and partnering with local businesses. Both students recently partnered with the jewelry company Go Rings, which allows them to take home 30 percent of profits for their World Race fund. This fundraiser practically runs itself as any purchaser simply adds one of the girls’ name at check out to have a portion of the purchase donated to their cause. 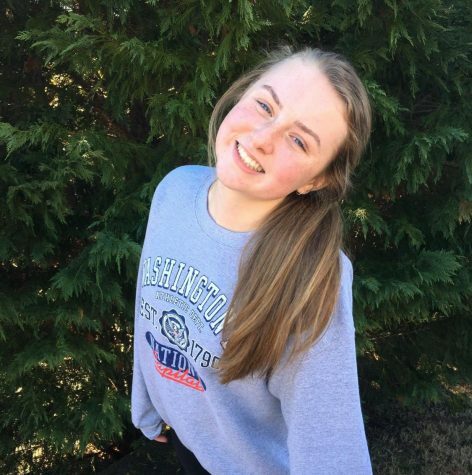 “I have been planning and have already done quite a few fundraisers to reach that $16,600. I have made GoFundMe pages and partnered with companies. I plan on selling t-shirts and setting up booths at different places,” Barnhart said. While on their journey, O’Bryan and Barnhart document progress on their blogs and Instagram accounts. Photos of them holding up posters they made or modeling the jewelry sold to fund their trip have taken over their feeds in the recent months. Along with their fundraising journey, Barnhart and O’Bryan blog about their progress and feelings concerning the nine-month trip. Each participant runs her own blog online and shares their individual experiences on the trip and about the trip. O’Bryan and Barnhart write their current blogs about their fears for leaving, but also their overwhelming excitement. After their application and acceptance into the World Race Gap Year, Barnhart and O’Bryan currently work on preparing themselves physically, emotionally, and spiritually for the months that lie ahead of them. In July, they will attend an 11-day preparation camp to learn how to live in a close-knit community in a foreign land. They will learn what to pack and how to live out of a single backpack for nine months while also preparing to hike for hours on end. The leaders of the program make sure to prepare the racers as best as possible by organizing a parent lunch and monthly phone calls with an advisor before leaving the country. Both girl’s families’ support them on this journey to grow as a person and in their faith. Until they embark on this life-changing journey, they will continue to fundraise to reach their goal.